You may know what I mean when I say Personal Progress or it may sound completely bizarre. 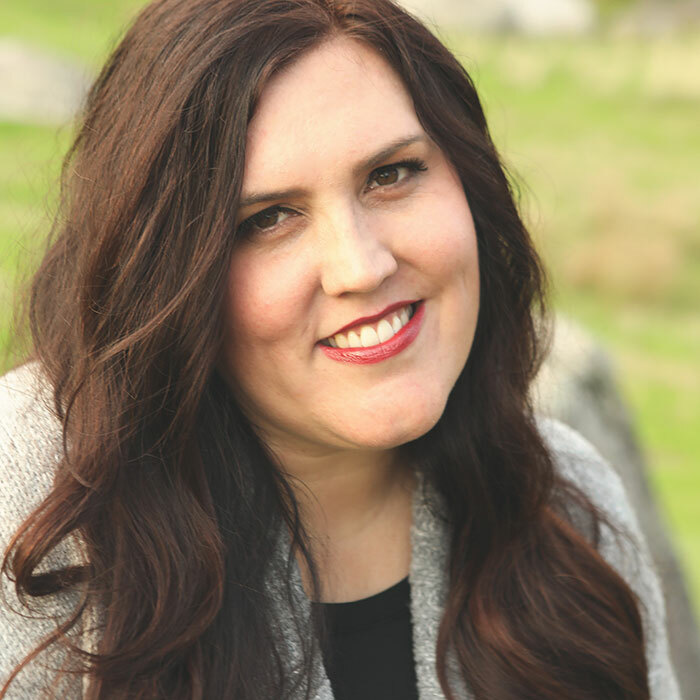 If you fall into the second category….One of my responsibilities at church is to help encourage the teenage girls at church to work on a goal setting program called Personal Progress. I believe wholeheartedly in this program so it’s easy to be a cheerleader (sans toe-touches, that would be awkward). Even if that all means nothing to you, hopefully you can apply these ideas to your church, scouts, school, community responsibilities. Buy clear pens, unscrew the back and pop in whatever message you want. These pens were pretty small and I had to do several trial runs and might have wanted to curse. 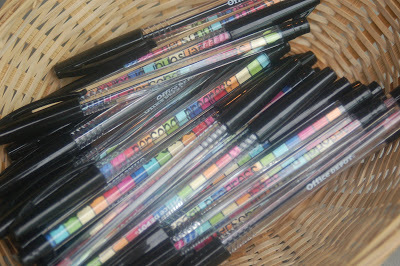 Buy the fattest pens you can find or don’t say I didn’t warn you. 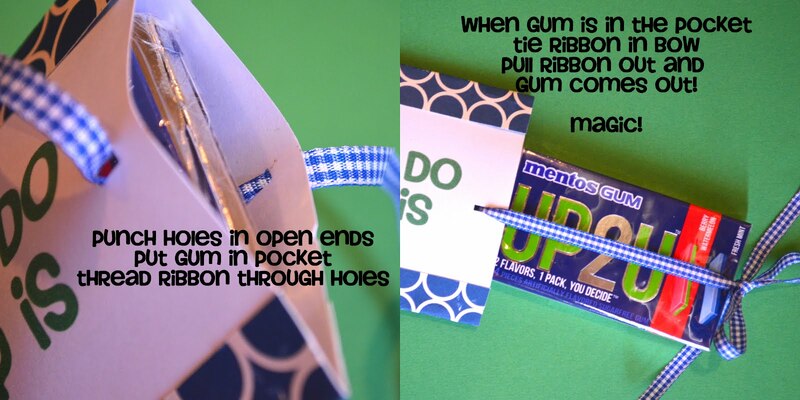 This is a fancy-schmancy envelope trick I use sometimes. I used it to wrap a cookie at the very end of Ashleigh’s blog post about sugar cookie basics. 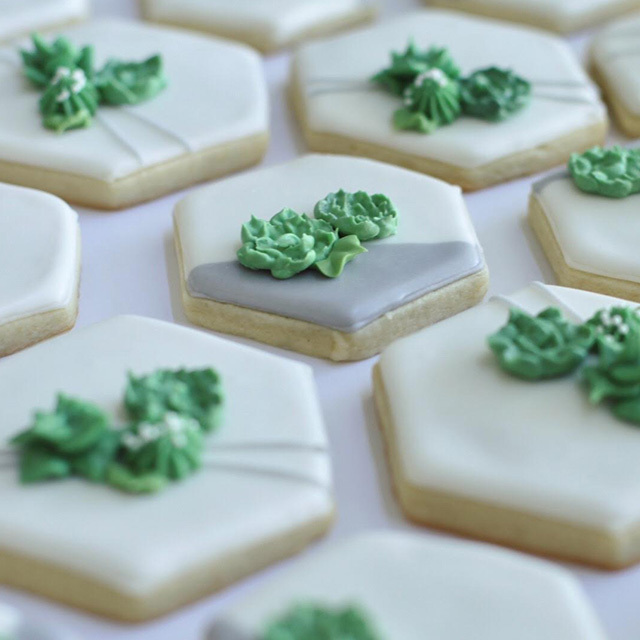 But, you know I only make sugar cookies every six months when amnesia sets in and I forget how I want to gouge my eyeballs out because they take so long. Just kidding, Ash! 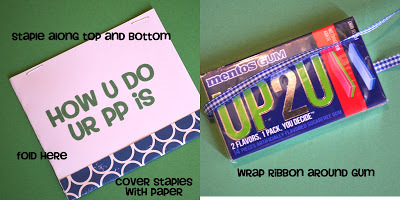 So, I opted for gum in my magic pocket and the brand “UP 2 U” was perfect. I always tell the girls that Personal Progress is Personal. It is a tool to help them learn and grow closer to the Lord and they can complete the goals they feel inspired to finish. 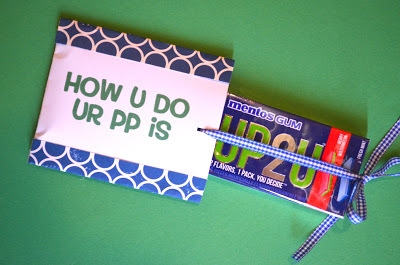 (And I know it says PP, I was hoping the text lingo would be stronger than the urge to laugh like my 11 year old boy) Ha ha! 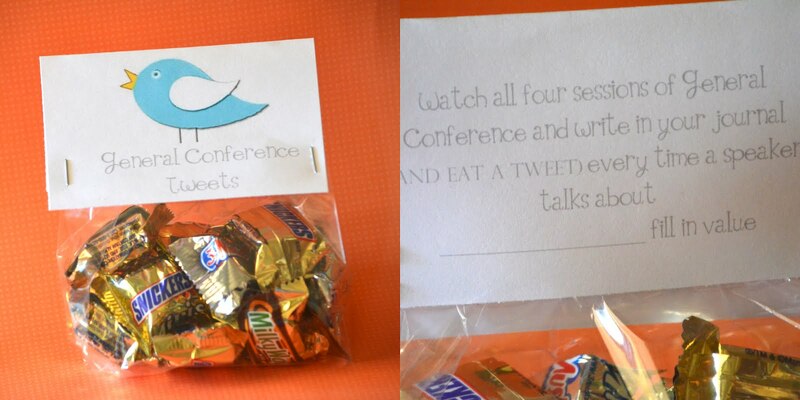 I gave out this incentive right before General Conference and reminded the girls they could complete a Value Project by watching all sessions of conference, the YW session and take notes. If you print one of these documents and then turn the paper around so the other document prints upside down. Then when you cut and fold the paper, they are ready to staple on to a bag with treats. I couldn’t resist a Hunger Games treat the Sunday after the movie came out. I was inspired by Ashleigh’s matchbook Valentine treats Adding some hot cinnamon gum was the perfect touch. I wrapped up some good old Twizzlers in a paper about Divine Nature #6 to remind them about the parts of the goal and a checklist for the two weeks it takes to do this goal. Then I wrapped it up in value-ish colored paper. The girls set a Personal Progress goal for the year so I wanted to remind them halfway through the year what their goal was so they could check their progress. 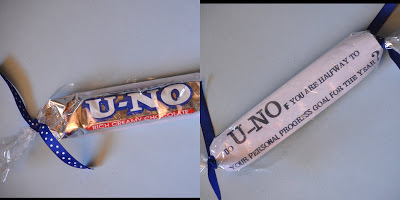 I wrapped up their individual goal inside the cellophane. 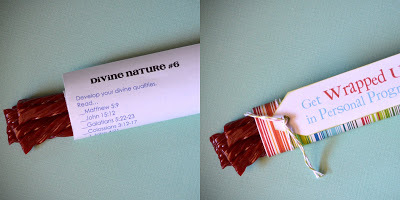 It’s never too early to start the Virtue value project so I did these Book of Mormon treats. Don’t forget to add the cute red ribbon down the middle. You can “Take 5” for almost anything. Go crazy! I am not above completely corny handouts and here is exhibit #1. They get candy, they don’t complain. 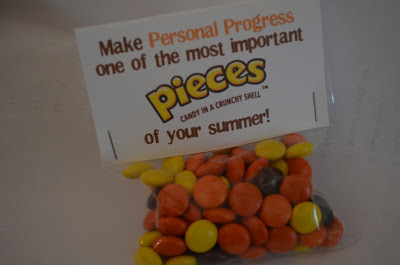 Even though they can rely on my corniness once a month, I never want the treats to overshadow the importance of the Personal Progress program. I often express to the young women that by setting these goals they will grow closer to the Lord and develop their own unique gifts. I routinely have interviews with them to show encouragement and love. This is an inspired program and a tool to help each of them know for sure that she is a daughter of God. 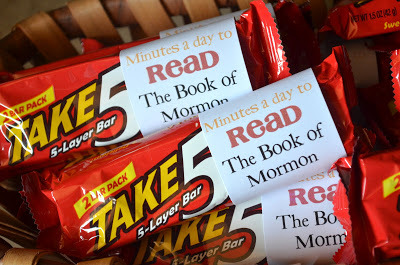 My goal is for them to have the desire open their Personal Progress book along with their scriptures and to feast. And after that feast, they can have their treat. Darn it, I wish you posted your awesomeness a few weeks ago, I could have used some of these up at camp, there is no way I am even starting a new project before Monday. Thanks for the ideas, I am pinning for the future. Great job Kass! If only I was one of the teenagers receiving these cute treats! If I set some goals could you pretty please send some my way?! Awesome and simple idea! Who knew that making Personalized Pens could be so easy. These are all darling. I am the PP adviser in our ward. I'm sure I will be back to these. What bags did you use for the make PP part of your summer idea?